Good news for genealogists! You can now access more than 4,100 recently digitized patent plans on the Archives of Ontario’s Visual Database. Use this great new online resource to trace your ancestors’ Crown land records. The images are fully accessible and in high-resolution in a zoomable format that allows you to view fine details. This is the RG 1-100 patent plan series, showing the status of Crown lands, whether patented, leased, or under a license of occupation. Several patent plans may exist for an Ontario township or town. Until the late 1970s, the Ministry of Natural Resources used patent plans as a tool to show the alienation of Crown land. When the information was computerized and the plans became redundant, they were transferred to the Archives. The images were chosen as key candidates for digitization, since they’re some of our most heavily used records and are very fragile. Using the name of the township or town, you can find a specific plan with a keyword search in the Archives of Ontario’s Visual Database. You can browse through all the digitized patent plans by searching by the reference code (RG 1-100) in the Advanced Search screen in the Visual Database. The Patent Plan images are also accessible using the Archives Descriptive Database. To view an item-level listing of archival information about the RG 1-100 collection, click here. When viewing results from searches in the Archives Descriptive Database, please look for a camera icon beside the search results. Clicking the icon will open a corresponding image in the Archives Visual Database. To use the zoom feature, move your cursor over the image and a magnified area will appear. Depending on which web browser you are using, the shape of the magnified area will appear as either a rectangular, square or a circular shape. To increase or decrease the zoom level, use the scroll wheel on your mouse. Scrolling up will zoom in to the area of the image immediately below the area you are magnifying. All images that have zoom capability also include a link to a higher resolution copy, which allows for viewing much more detail in the image without the requirement for zooming access. To access the higher resolution copy, click the link above the image titled “Click here for the full-sized image”. Clicking on the full sized image link will open a new browser window. Depending on your web browser, you may need to click on this image again to view at full size, as the image will be resized to fit your browser window. Can’t Find a Digitized Patent Plan? Most, but not all of the Patent Plans have now been digitized. 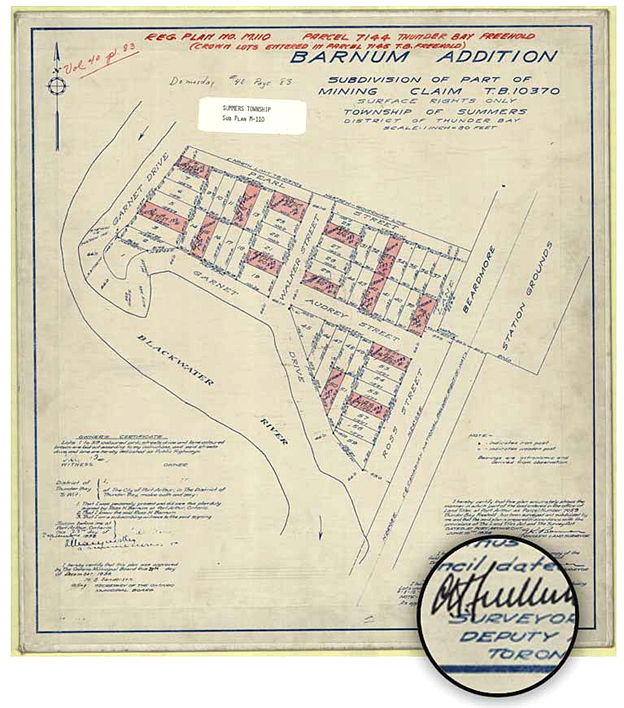 You can check if we have an original plan using our Archives Descriptive Database; enter the name of the township or town in the keyword(s) field, and RG 1-100 in the Archival Reference Code field.